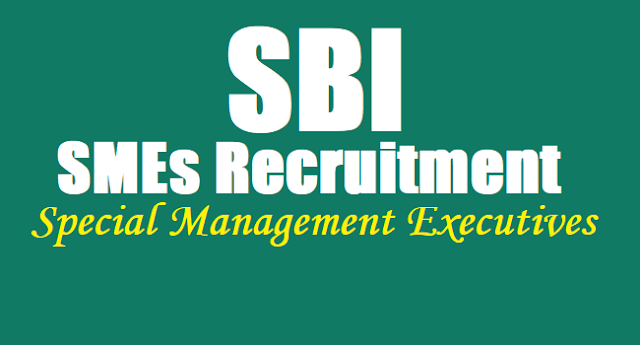 SBI Special Management Executives(SMEs) Recruitment 2017 Results announced/ SBI SME(Banking) Posts Recruitment 2017 Admit cards, State Bank of India 554 SME Posts Recruitment 2017 Notification, SBI SME Posts Recruitment 2017, State bank of India officials has issued 300 Special Management Executive (Banking) Posts Recruitment on 21st June, 2017. SBI invites applications from eligible, interested, dynamic banking or financial sector executives for the post of Special Management Executives (Banking) [SME(Banking)] in middle management grades scale II and II in the State Bank of India. Excellent career opportunities with the premier bank of the country where tradition is blended with technology and innovation. Be a part of a warm work environment where employee inputs at all levels are valued and where aspirations are nurtured for reaching the pinnacle. Special Management Executives Posts Recruitment 2017: SBI Recruitment of Special Management Executive Post: State Bank of India (SBI) has announced 554 vacancies for Special Management Executive (SME) post. Online applications can be submitted till 18 May 2017. While a total of 273 vacancies are open for recruitment in MMGS III grade, 281 are for MMGS II grade. Only those candidates who have educational qualification of CA / ICWA / ACS / MBA (Finance) or equivalent post graduation degree in Finance are eligible to apply. Other details can be found below. "The course should be of 2 years full time duration. Courses completed through correspondence / part-time are not eligible. The institute should be recognized / approved by Govt., Govt. bodies / AICTE", reads the official notification. Candidates have to undergo strict selection procedure for the SBI SME recruitment which will include online objective test, group exercise and/ or group interview. The online test will comprise of questions related to general/ banking awareness, reasoning, data interpretation and analysis, English and financial data interpretation and analysis. On the other hand, State Bank of India (SBI) has begun online registration for recruitment of Specialist Cadre officers on regular and contract basis. As of now, the Bank has decided the following cities for the exam Ahmedabad, Baroda, Bangalore, Mysore, Bhopal, Indore, Bhubaneswar, Sambalpur, Chandigarh, Ludhiana, Jammu, Chennai, Madurai, Guwahati, Dibrugarh, Hyderabad, Vijayawada, Kolkata, Asansol, Lucknow, Varanasi, Mumbai, Nagpur, Delhi, Jaipur, Patna, Ranchi, Kochi andTrivandrum. Applicants should have minimum age 25 years and maximum age 35 Years are only eligible to apply for this recruitment notification. The course should be of 2 years full time duration. Courses completed through correspondence/ part-time are not eligible.The institute should be recognized/approved by govt.,Govt.bodies/AICTE) Minimum 60% marks in graduation and in MBA/MMS/PGDBA/PGPWPGDM. In case of CA/ICWA/ACS, passing the examination is sufficient. Selected officials will be appointed in specialist cadre and will be on probation for one year.They will be governed by the extant specialist cadre placement and promotion policy. The officials have an option for conversion to general cadre after five years including probation period.The officials have excellent career progression opportunities. Salary includes in addition to basic pay, DA & CCA as per rules in force. The compensation package includes perquisites such as furnished accommodation or HRA, conveyance allowance, medical benefit, LFC/HTC, loan at concessional rates etc.Total compensation in Mumbai is about 410 lakhs in respect of SME (MMGS II) and Rs. 2 lakhs in respect of SME(MMGS III). Applicants are advised to please visit Career With Us Link in Bank's Website at www.sbi.co.in or www.statebankofindia.com for detailed advertisement and application procedure. State Bank of India (SBI) has declared the result of the examination held on 18 June 2017 for recruitment to the post of Special Management Executives (SME). The Bank has released list of all candidates shortlisted for group exercise and interview. The examination was held for selecting candidates against 554 available vacancies. While a total of 364 candidates have made it to the interview in MMGS III scale, 571 candidates have been selected for the interview round in MMGS II scale. The detail candidate list is available at sbi.co.in.